Curexe is a web-based money transfer solution designed to help businesses and people pay for products, services, and staff online. It is presented as a more affordable alternative to traditional and other popular payment services and channels such as bank transfers, money remittances (Western Union, Xoom, etc. ), and PayPal to mention a few. 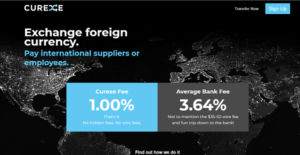 With Curexe users pay the lowest fees for foreign currency exchanges and online payments. In contrast, conventional bank transfers and online payment channels charge their clients with an average 3.64% bank fee on top of $35-$50 wire fee. For those who do their transfers physically over the counter, the trip alone also costs them money. Curexe does not surprise its users with hidden charges and humungous transaction or processing fees. This affordability makes it the payment channel of choice for businesses and individuals in North America. Curexe provides you with a currency exchange and online payment solution that saves you more money than ever whenever you do foreign currency exchanges or money transfers. Paying your staff or purchasing a product online has become easier and faster with the advent of online payment channels and bank transfers. But that doesn’t mean it won’t cost you money. On the average, a typical bank transfer transaction charges you 3.64% of the amount that you are sending. On top of that, you also have to pay other amounts for the wire fee and hidden charges banks and remittance service providers will never tell you about. While the amount may seem small, add them all up and you will realize these charges take a huge chunk of your budget. With Curexe, you only pay for 1% for foreign currency exchanges, 2% for online invoice payments via online banking, and 0 fees for wire transfers.There are no wire transaction charges and hidden fees piling up. You save a lot of money and you don’t have to go down to the bank to do the transaction. It’s all online. Curexe offers more than just huge savings on your end. Through The Canada Deposit Insurance Corporation (CDIC), every penny you transact is insured and safe. Once you signed up, all your information is protected via very secure data encryption. You can transfer money or exchange currencies 24 hours a day from 9pm EST on Sunday until 4pm EST Friday. The whole process only takes you 30 seconds to transfer funds, saving you not only money but time as well. What Problems Will Curexe Solve? Canadian business owner sends their monthly $2,000 USD invoice to a US-based business for email marketing services they provide. The US business owner pays through PayPal directly in the invoice from Quickbooks. The cost for the US business owner is $0. The cost to the Canadian business owner is 2.9% + $0.30 [or $58.30]. AND PayPal forces the business owner to exchange their USD to CAD if they want to deposit funds into a Canadian bank. They do this even if you have a USD bank account in Canada, because they want the foreign exchange fees. They charge you another 3.5% to exchange your USD back to CAD [or $70]. The total cost to the business owner is $128.30, but they have 15 clients in the US that they bill for various amounts totaling a monthly amount of $85,000. Out of these $85,000 PayPal takes $5,440 out of this business owner each month. A Canadian business makes custom suits and is importing suits already made from Thailand after they send measurements to the Thailand supplier. The Thailand supplier invoices in Thailand Bahts (THB) the local currency. The Canadian business owner was getting charged 8% of their $15,000 weekly payment [or $1,200 a week] in bank fees. A foreign exchange company cold called them and told them they can save a lot of money by switching to them. The business owner switched and is now paying 3.3% of their $15,000 weekly payment [or $495 a week] in bank fees and all they have to do is send an email to the company with the banking details instead of walking inside a bank. Then Curexe contacts them and they realize they can make a transfer in less than a two minutes online and they are charged only 1% [or $150 a week] saving this business owner $345 a week. A Canadian social media analytics company charges clients all over the world in USD and they all pay through Credit Cards for their ongoing monthly $150 USD charges. The Canadian business is able to deposit USD with Stripe into their Canadian USD bank account. They go to their online banking and can easily exchange their USD to CAD to make their $50,000 monthly payroll. When they were using their bank they were charged 3% and their monthly cost was $1,500. They were not approached by a foreign exchange company. They started working with Curexe for a 1% cost saving them $1,000 each month. If you are interested in Curexe it may also be sensible to analyze other subcategories of Best Payment Gateway listed in our database of SaaS software reviews. Since each organization has unique business wants, it is advisable for them to refrain from seeking a one-size-fits-all ideal software system. Needless to say, it would be pointless to try to find such a system even among popular software platforms. The smart thing to do would be to list the various important factors that need consideration such as key features, finances, skill levels of workers, company size etc. Then, you should do your groundwork thoroughly. Read some Curexe reviews and check out each of the other apps in your shortlist in detail. Such comprehensive groundwork can make sure you reject ill-fitting systems and choose the app that provides all the elements you require for business success. How Much Does Curexe Cost? Contact Curexe to know more about their basic and enterprise pricing offerings. We realize that when you make a decision to buy Payment Gateway it’s important not only to see how experts evaluate it in their reviews, but also to find out if the real people and companies that buy it are actually satisfied with the product. That’s why we’ve created our behavior-based Customer Satisfaction Algorithm™ that gathers customer reviews, comments and Curexe reviews across a wide range of social media sites. The data is then presented in an easy to digest form showing how many people had positive and negative experience with Curexe. With that information at hand you should be equipped to make an informed buying decision that you won’t regret. What are Curexe pricing details? What integrations are available for Curexe?